Today, the Senate Foreign Relations Committee held a long-anticipated hearing on the Keystone XL Pipeline. This hearing aimed to explore whether the pipeline is in our national interest and included panelists such as esteemed climate scientist, Dr. James Hansen, and Sierra Club Executive Director, Michael Brune. Also testifying were Karen Harbert, president of the Chamber of Commerce’s Institute for 21st Century Energy, and General USMC James L. Jones. Opponents of the proposed pipeline argued that allowing Keystone to pass through the U.S. would be assuming a large amount of risk, with little pay off. The majority of this dirty tar sands oil would be exported, but not before passing through America’s heartland. Denying this pipeline would send a clear message that the U.S. does not want dirty tar sands oil passing through our communities. Here are some of the best quotes from today’s hearing! Proponents of the Keystone pipeline like to argue that this tar sands oil will be developed regardless. But the truth is that Canada has been exploring other options and is hitting significant opposition. For example, native tribes in western Canada have made it clear that they will not allow a pipeline through their native lands. Senator Tim Kaine gets it, this is not about the pipeline, it is about dirty tar sands oil that should remain in the ground. Senator Boxer gave a strong testimony, citing the vast health impacts as one of the primary reasons to reject the pipeline. Accompanied by nurses from across the U.S., she talked about the health impacts of living near refineries. Often these places will have much higher rates of cancers and asthma, especially in children. Really?? I think the large majority of environmentalists are going to have to disagree with Ms. Harbert on that point. Tar sands is one of the most carbon intensive fuel sources. As we try to limit our overall carbon impact, it is important that we focus on reducing the most carbon intensive fuel sources. We are all in the same boat, no matter your party (or your species!) you will be affected by climate change and dirty fuels projects. Keystone XL pipeline will cut through America’s agricultural heartland, the Missouri, Platte, and Niobrara Rivers, the Ogallala aquifer, habitat for sage grouse and sandhill cranes, walleye fisheries and much more. 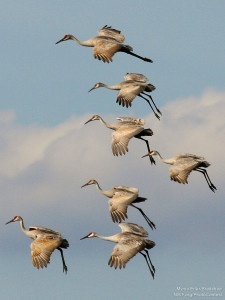 Migratory birds are especially at risk as many of their migration paths follow the proposed Keystone pipeline route. Habitat disruption in these areas would negatively impact these migrating species as well as the communities in the surrounding areas. Take action now! Speak up for wildlife species and communities that would be impacted by Keystone XL and dirty tar sands projects.